iGet can resume file transfers, and can also detect when a resume would not work. If you try to download a file, but you already have a file of the same name in the destination folder, iGet notices. If possible, it will resume the download. But, in cases where the file is actually not the same, iGet will present you with some sensible options: download the file to a new location, move your existing file to the Trash and download the remote one, or skip the item. In the picture above, the user is at work, downloading her favorite album from her iTunes folder on her home Mac. iGet has noticed that one of the files she already has conflicts with the one of the files she is trying to download. 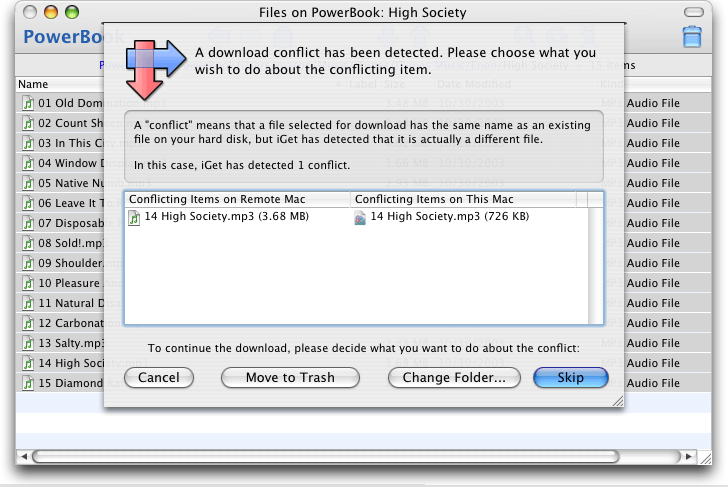 In this case, the reason there is a conflict is that she previously started to download the song High Society from a different Mac. However, on that Mac, iTunes uses the default 128Kbps encoding, whereas her Mac at home uses a higher quality setting. So, even though the files might appear to be the same at first glance, iGet has noticed that they are actually different and prevented her the inconvenience of getting a screwed up MP3 file. She will choose the "Move to Trash" option, which will move the lower quality file to the Trash, and start over downloading the file from the beginning.